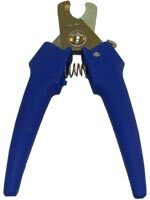 Jorgensen Nail Trimmer 6.5" Heavy Duty w/Safety Lock - Blue is especially designed for cutting the nails of bigger breeds. Works well on all size nails, and it's also good for docking tails and removing dew claws. These trimmers have an attractive raised colored rubber insert in the hand. This new design has a firmer comfortable grip with a professional look. Also features a safety lock at handle bottoms. Light blue with dark blue rubber inserts. Packaged in resealable pouch.